How can cross-sector collaboration lead to innovation? Global Partnerships Week 2016 brought together leaders and organizations from across sectors to recognize the critical role public-private partnerships play in promoting diplomacy and development worldwide. 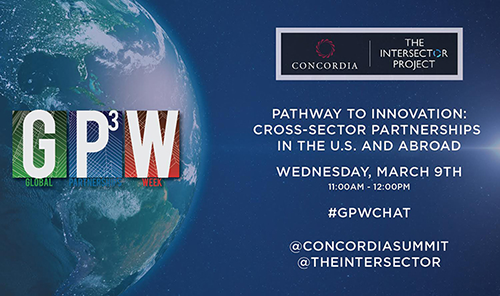 We were thrilled to participate this year by co-hosting a Twitter chat with Concordia, one of GPW’s organizers, celebrating the theme of this year’s GPW: “Leveraging Innovation in Partnerships.” On Wednesday, March 9, we took to Twitter to moderate a discussion on “Pathway to Innovation: Cross-Sector Partnerships in the U.S. and Abroad.” With Concordia’s global perspective, and our domestic focus, we were excited to share our ideas and hear others’ thoughts on this topic. Concordia and The Intersector Project were joined by organizations and individuals with a wealth of knowledge on public-private partnerships, cross-sector collaboration, and global affairs. Participants included The Secretary’s Office of Global Partnerships at the U.S. Department of State, PeaceTech Lab, U.S. Foreign Assistance, and more. The discussion spanned a range of topics, from the differences in how the government, business, and non-profit sectors conceive of innovation, to potential non-technological ways of innovating, to the challenges cross-sector partners might face in creating a culture of innovation. Throughout the discussion, participants engaged in new ways of looking at partnerships, discussed inspiring examples of partnerships from across the world, and shared resources that can help collaborations overcome some of these challenges, including Concordia’s P3 Index and The Intersector Project’s Toolkit.